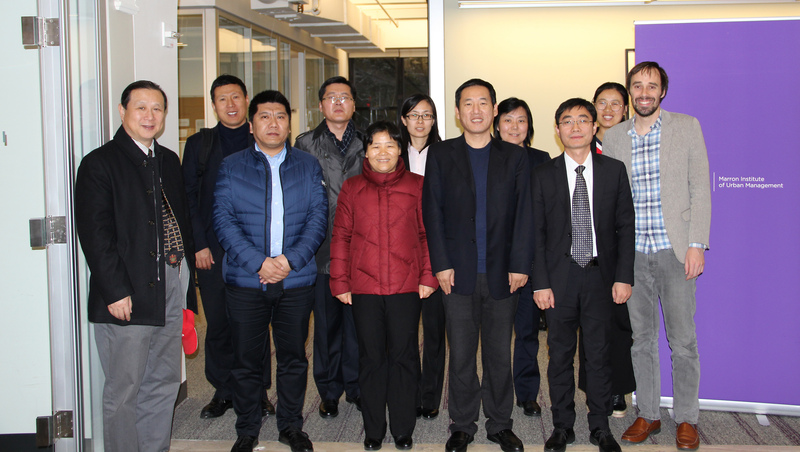 On November 15, Dr. Kevin Cromar hosted a delegation of nine air quality officials from Shandong Province, China, to provide training and discuss implementation strategies for China's recently released "Blue Skies" three-year action plan. The discussion covered strategies for fleet conversion (大力淘汰老旧车辆), potential improvements to vehicle emission testing (加强移动源排放监管能力建设), risk communication strategies (风险沟通策略), and addressing equity issues in air quality management plans (环境正义). The Air Quality Program is looking forward to continued collaboration in Shandong Province by providing additional guidance and assessing the effectiveness of specific management strategies. Dr. Kevin Cromar (far right) with air quality officials from Shandong Province, China.